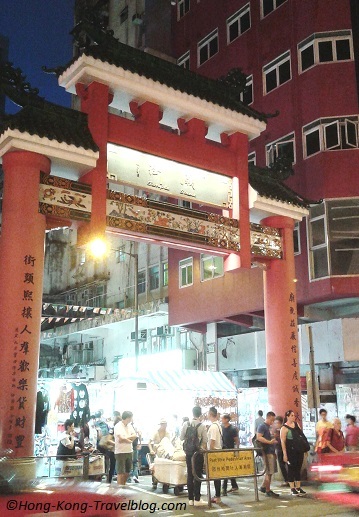 Temple Street Night Market is a popular tourist attraction located in the areas of Jordan and Yau Ma Tei, Kowloon. Being one of the most vibrant street markets in Hong Kong, the night market is well-known for its variety of low-priced merchandise and roadside dining. Temple Street was named after a Tin Hau Temple located there. The street can be found on the map of Kowloon as early as 1887. At that time, Temple Street was divided into two sections, which were Temple North Street and Temple South Street, taking Tin Hau Temple as the landmark. Since 1920s, the square in front of the Tin Hau Temple (commonly known as Banyan Tree Head), has become a focal point for street artists, hawkers and snack stalls. That is why there is a street called Public Square Street next to the temple. In 1975, the Hong Kong Government set up a hawker-approved area in Temple Street. Until now, there are over 600 designated stalls for street sellers. Temple Street Night Market is a little food paradise filled with local food stalls and Dai pai dong. Here you can find seafood, claypot rice, noodles, street food and other treats. As the local delicacies are delicious and affordable, they are welcomed by many locals and foreign tourists. Tips: As mentioned above, Temple Street is divided into two parts, now by Yau Ma Tei Carpark Building and Tin Hau Temple. 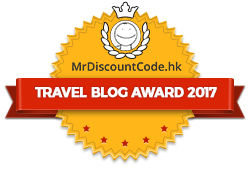 There are more seafood restaurants near the Jordan MTR end, while there are more claypot rice restaurants near the Yau Ma Tei MTR end. 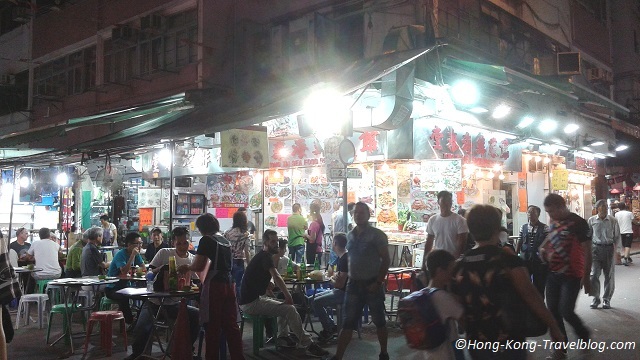 While it is a bit similar to Stanley Market, you can find more down-to-earth, typical local culture in Temple Street Night Market. The street stalls sell all kinds of items at low prices, including souvenirs, apparel and accessories, handicrafts, tea sets, jade, antiques, electronic products, watches, CDs, and even adult products. There are second hand goods like cassettes, video tapes and old newspapers especially in those shops hidden in the streets behind the stalls. The market is also known as Men’s Street as many products target at male customers. Actually, it does sell items suitable for female and kids like Cheongsam/Qipao and toys. In the early years, there were some martial arts performers. Nowadays, there are numerous fortune tellers and matchmakers especially in Market Street right next to Tin Hau Temple. Outside the Tin Hau Temple, fans of Cantonese opera gather together for impromptu performances. That’s why it is also called the Civilians’ Night Club. Sometimes, you can hear Cantonese pop songs and even Western pop music. Volunteers are welcomed. In case you want to sing a song, don’t forget to make a contribution. Paifang or Pailou can be found everywhere in Hong Kong, in particular, at the entrances of villages or temple. 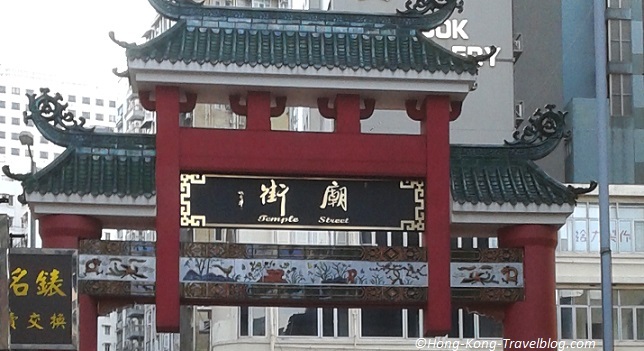 However, the two archways at Temple Street are the first of its kind in Hong Kong. The iconic archways were established in 2010 to recognize the contribution of the community there and to create a landmark for this lively tourist attraction. 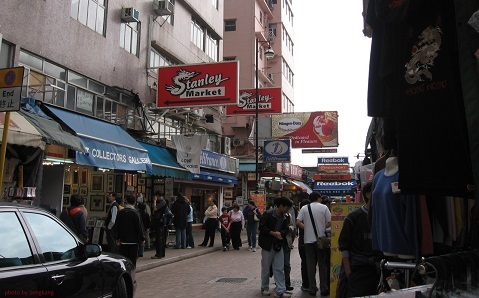 Many directors chose to shoot a film in Temple Street because of its unique culture which could represent all walks of life in Hong Kong. The street has become a backdrop of many memorable movies and series, such as Queen of Temple Street (1990) featuring Sylvia Chang and Rain Lau; The Prince of Temple Street (1992) starring Andy Lau, Joey Wong, Deanie Ip and Ng Man-tat; Stephen Chow’s the God of Cookery (1996); the TVB series Street Fighters (2000) starring Hacken Lee and Edmond Leung; and C’est La Vie, Mon Chéri or New Endless Love (2008). The market officially opens at 2pm as no traffic is allowed on the main street. But sellers usually start setting up their stalls at around 4-5pm. So, you can expect to feel the lively night market starting from the evening. 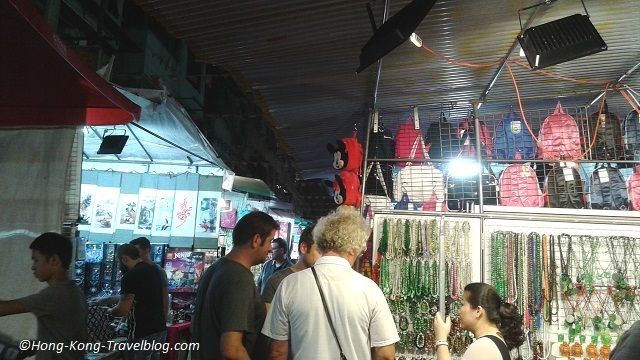 Have you been to or are you planning to visit Temple Street Night Market Hong Kong? Which parts do you like most? Please feel free to leave us comments or contact us if you have any questions.